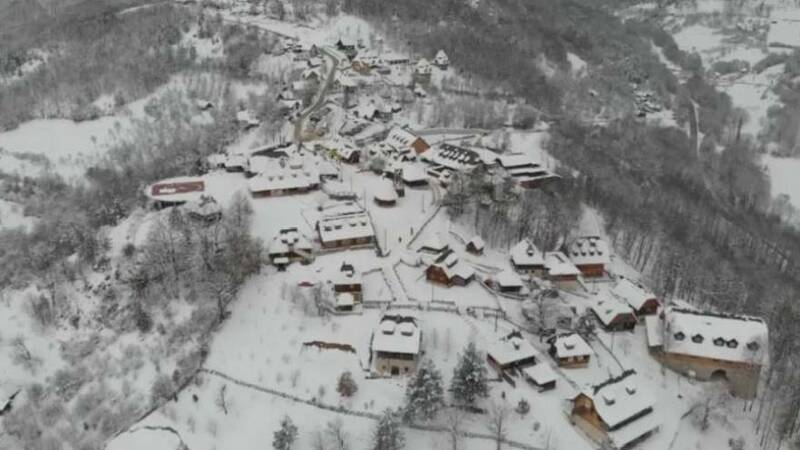 Hosted for the twelfth time in Mokra Gora, Serbia, the event saw future filmmakers and acclaimed authors gather in the fairytale, hilltop location. The festival took place in an ethno village built by Serbian filmmaker Emir Kusturica for his film "Life is a miracle". Created by Kusturica and partly financed by the Serbian government, the festival aimed to promote independent cinema, the filmmaker told Euronews. “We are at a crossroads — technology brings easy ways to make many more movies that we did in the past, but we miss the movements and the ideologies that we had in the 1970s. The festival's "anti-capitalist" soul was clear from the films nominated in the competition. One such film was “All inclusive” by from Corina Schwingruber Ilic. The movie, which is set on a cruise ship, denounces modern society that is obsessed with mass entertainment. “I really hope that people start thinking how we spend our holidays, how do we actually spend our all lives and daily lives — consuming and not thinking? Another film, “Being More Like Bagsy”, focuses on whether people can be defined by their jobs. The story is about an unemployed woman who finds new meaning in her life thanks to an unusual offer from the waste disposal company. The director, Mikkel Storm Glomstein, was formally a politician for Norway's Green Party. He said: “We are entering in a period where we might see that quite a few people are becoming economically redundant, that they don’t have any function in the economy any more. Our correspondent, Elena Cavallone, was at the festival. "At Kustendorf, the atmosphere is very informal. "Young directors and famous filmmakers share spaces, meals and ideas, thanks to the workshop organized throughout the day. "And while you are sipping your coffee, you might get the chance to have a chat with international cinema star." Indeed, Matt Dillon was the special guest of this edition. He told cinema students anecdotes about his long career in the film industry. Euronews asked him if Hollywood has changed since the start of the Me Too movement. “Yes, and yet I do believe that I am not in censorship," he said. In the evenings, music took the spotlight. Musicians from the Balkans and beyond paid tribute to their traditions: a way to celebrate the cultural diversity that underpins this festival.